As the spiritual homeland of diet staples like bread, cheese, and Chardonnay, it’s easy to see how France has retained a steady perch as the food capital of the planet Earth for a couple of centuries now. The secret to their success probably has something to do with their strict adherence to traditional cooking methods—even going so far as to pass laws about how baguettes must be made—and all the energy they save by not pronouncing half the letters in any given word. We appreciate their culinary gifts to the world more than the rise of the sun, and that’s why we’re delving into the sweet and fragrant world of French dining to bring you your definitive guide to Brisbane’s best French restaurants. The space is so faithfully decked out to emulate a Parisian brasserie with booth seating and low lamplight that I’m not entirely sure that the threshold isn’t actually a teleporter. The heavy red drapes help shut out the real world as guests enter a timeless capsule where plates of escargots are the norm and jazz plays at all hours. We definitely recommend getting something from Madame Rouge's grill and rounding it out with as many sides as you can fit on the table. Besides making maybe the best pomme frites in the city, Boucher gets tens across the board for every one of their dishes. Their menu delicately treads the cross-section where classic meets modern, striking a nice balance between the reverence of French tradition and the temptation to go completely off-piste. I can’t rate the bouillabaisse highly enough. Everything about Montrachet keeps the embers of the belle époque burning. The luxurious interior with rich timber furnishings and soft gold lighting will charm the life out of you before the amuse bouche even hits the table. Naturally, the menu is a feast of French classics that have cemented Montrachet position as one of Brisbane’s best French bistros since 2004. There is no doubt that classic French cuisine is a glamourous affair, and Privé249 has it on lockdown. With an extensive French Champagne and liqueur list to start your evening of luxury, move on to their modern French menu that is always meticulously created and delivered. Dress to impress and get ready to be wowed with this one! Decadence is the name of the game for Lutèce. Their kitchen cooks up extravagant offerings well beyond the tradition of their a la carte menu, notably the four-course lobster menu and the pride of the menu: Canard à la Presse. Their iteration of the 19th century dish is a complex melee which sees roasted duck breast drizzled in red wine reduction, with truffle potato mash and peas a la francaise. If you were after the pinnacle of French cuisine, you have to check it out. That’s literally all there is to this local Milton bistro. Having served classic French cuisine to the people of Brisbane for just shy of 30 years, Two Small Rooms is as traditional as they come. Fresh from a recent revamping, their new look is still as minimal and fuss-free as ever, siphoning all effort into providing a delectable French feed. The time-honoured MO of French restaurants champions traditional interiors to echo the traditional cuisine, but Greenglass is the hip, cool departure from the norm. 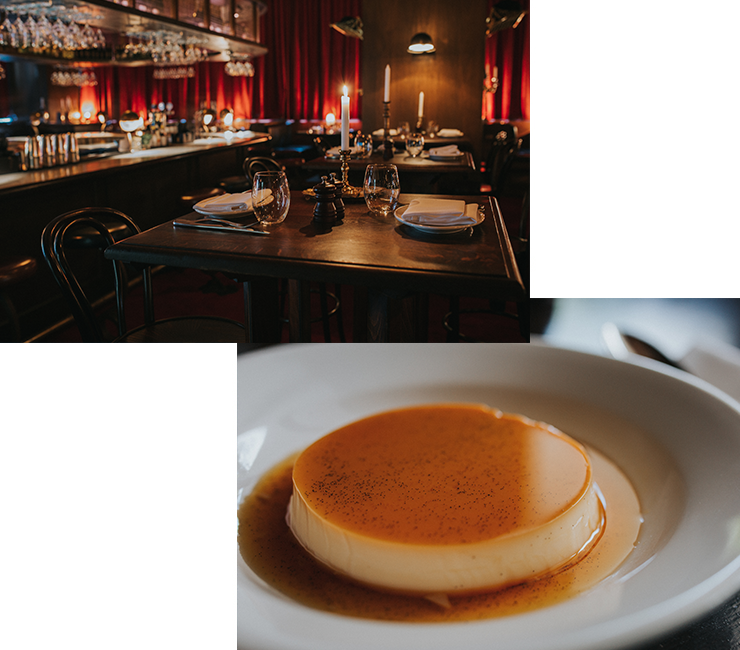 Fusing the best of France and Australia into one clandestine cavern, Greenglass offers a refined and seasonal menu of French dishes alongside a cracking list of Australian wines within an almost Nordic space. Perfect for your next power lunch. Okay, so while The Long Apron is a little way out from Brisbane itself, trust us, it's well worth the drive. Tucked away in the beautiful Spicers Clovelly Estate in the hills of Montville, The Long Apron is easily considered one of the best restaurants in QLD—and with 2 hats, you bet it's going to be an experience you won't forget. The Long Apron delivers the goods if you're after locally sourced produce (from surrounding farmers and suppliers in the Sunshine Hinterland no less), and incredibly original, beautifully presented cuisine.